Transcranial magnetic stimulation (TMS) is a much needed treatment for patients with major depressive disorder who are treatment resistant. How does it work? What are some possible explanations of its action in the brain? How does it affect the treatment of depression? TMS is a noninvasive technique that uses magnetic fields to induce weak electric currents in brain tissue. As a result, brain neurons can be excited without the need for external electrodes, anesthetics or added medications. A coil is placed on the patients’ head over one of the areas responsible for symptoms of depression (prefrontal cortex). 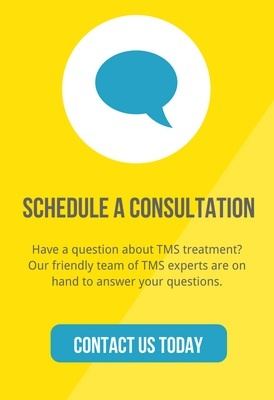 TMS can be classified into 2 different types: high-frequency and low-frequency. High-frequency TMS may be defined as a higher 1Hz+ (Hertz) application to the left prefrontal cortex, and low-frequency TMS as 1 Hertz or less applied to the right prefrontal cortex. Technology and science are gradually identifying ways to predict who is going to have a better response to TMS treatments. For example there is information demonstrating that higher function in brain networks and connections between frontal lobe areas and deeper areas (striatum) predicts better TMS treatment response in patients suffering from depression (M. Avissar 2017). Frontal lobe dysfunction has been considered central in our understanding of the process of TMS treatment for depression. Since the 1980s, studies in science publications have documented the efficacy of TMS targeting this area. The depressed state is characterized by low activity in frontal areas and (as recently demonstrated in several studies) elevated functional connectivity in midline frontal and parietal areas. The strength of functional connectivity to certain brain areas ( anterior cingulate cortex-prefrontal cortex) is already considered a predictive biomarker for response to TMS. TMS over the left DLPF at high frequency modulates serotonin neurotransmitter release in healthy volunteers and a similar response has been reported in animal models. There is evidence that TMS to the left DLPFC modulates GABA and glutamate systems that might correlate with response to treatment of depression. In one study, Teneback and colleagues identified increased activity at the cingulate and increased paralimbic blood flow after 2 weeks of TMS treatment. This finding is important as the cingulate effect has been demonstrated to be blunted in depressed patients; interestingly, antidepressants such as fluoxetine have also been shown to increase cingulate activity. How can we use our current understanding of brain function, brain dysfunction in depression and TMS to enhance TMS treatment for depression? How can we optimize treatment strategies and perhaps start predicting treatment response? One strategy is focusing on time domain (number of sessions, parameters, length of duration of treat- ments) and simultaneously maximizing all other interventions such as psychotherapies and antidepressant medication. would add a practical methodology for prediction of treatment outcomes or reduction in symptoms. Dr. Oscar G. Morales, MD, is Senior Medical Advisor for Achieve TMS since 2017. Dr. Morales pioneered the development of TMS as the founder (2009) and Director of McLean Hospital TMS, Harvard Medical School Affiliated Hospital, and the Faculty Adult Residency Psychiatry Program Harvard MGH-McLean Hospital.